I'm speaking at RANT on Object Orientated Security Policy. This is a post implementation talk which will highlight the benefits of having a visual policy framework with executable procedures arranged in an inheritance hierarchy. The event is being described as: "Graeme’s rant will be looking into how the Security policy landscape is changing and how policies can no longer afford to be a loose collection of word documents seldom referred to. He will talk about how it is the business logic and rules of the organisation which are now becoming executable thanks to web services." 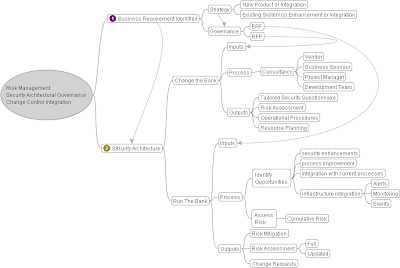 Risk assessment is a mandatory activity under all the Information Security policy frameworks e.g. COBIT, ISO27001. However, risk assessment methodologies are point-in-time and don't deal with incremental risk as the above process does. We're organising another "beer in the evening" event somewhere round about Smithfield in London to discuss Haskell, multi-core, HPC, Security and all sorts really - so if you fancy having a beer or two with a gang of gnarly, middle-aged architects, programmers and scientists (attractive huh?) then you'll be very welcome. As All Bar One has now closed, we will be in the Bishop's Finger, Smithfield. I'm planning on getting there around 530pm. My mobile number is zero seven eight three zero three six eight zero two four - when you get there give me a call. There's a good chance we'll get some of the beers paid for too but no promises yet. Is Haskell and multi-core the best solution to meet the projected demand for simulation in finance or has FPGA yet to have it's day? Challenges of Haskell and high performance messaging integration. 2.4 million messages per second (not transactions) are now possible using tools like LBM from 29West. The K language (an APL derivative), Fortran, Objective-C, LISP and Smalltalk gained a small foothold in the eighties/nineties in quantitative analytics but C++ remained the main language of implementation due to availability of skillset (K programmers are like hen's teeth.) Java and now C# are now the de facto implementation languages but have serious issues for high frequency finance - will Haskell be able to make an impact or will it be another marginal language used by quants. Is Haskell capable of high performance? Haskell Data Parallelism versus state of the art FPGA approaches. Check out HPCPlatform's offering btw. Collaboration was a theme that underlay some of fundamental concepts behind the Trade Ideas platform from youDevise. This presentation highlights some of the many threads which prevailed at the time. A presentation given in 2005 to the FITE Club. This was the foundations to my paper on Community-of-Interest predicated Program Trading which was presented at the Operational Research Society Conference, OR49 in September 2007. Another presentation from the past. Presented at Platform's Grid conference in Paris in 2006. OpenTech2008 is being held in London on the 5th July 2008. The conference is "an informal, low cost one-dayer on technology, society and low-carbon living, featuring Open Source ways of working and technologies that anyone can have a go at."